Not all canned foods are created equal! Canned veggies do count as a serving of veggie but often they're so salty it's just not worth it. Download ShopWell and we'll recommend some great products and ways to boost your daily veggie intake. It's free! 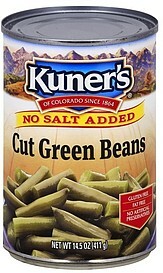 Cut Green Beans, Water. Gluten free.